The evidence in support of its use. Quality indicators should be developed through careful consideration of the best available evidence, such as that from systematic reviews, and the use of an appropriate rating process. However, before embarking on the development of a new quality indicator, researchers should ensure that a valid indicator has not already been developed; a scoping review can help with this process. Another approach that can be used when there is a lack of existing evidence to inform the quality indicators is the Delphi method. In the Delphi method, individuals complete several rounds of anonymous ratings of potential quality indicators on a risk–benefit scale and meet in person between the rounds to discuss the ratings. This process should be followed by a test of the indicator in real practice settings. A similar process for developing quality indicators is through the use of evidence-based practice guidelines. In this method, a panel of relevant stakeholders develops indicators based on the guideline recommendations. How can we measure the gap? The use of quality and safety data sets to show trends, in particular data on falls, infections, and other adverse events. At the population level, we can consider the needs of the population using epidemiological data, which are objective assessment measures. However, the main limitation of some of these administrative databases is that they were not developed for research purposes and may have missing or insufficient population data. Clinical databases can also be used to perform gap analyses. These registries may have data that is complementary to that included in administrative databases. Therefore clinical databases can be used in combination with administrative databases to provide additional details on practice gaps. Needs assessments at the organization level may be done at the level of a hospital or clinic. These organizations often collect information on infection control, mortality, and length of stay, that could be used to collect information on gaps. With the growing use of computerized health care records in hospitals and community settings, these tools can also be used to extract data for gap assessment. Chart audits can be done to review and assess health records using preset standardized criteria. The Donabedian framework for considering quality of care that separates quality into structure, process, and outcome can also be used when considering a chart audit. The main limitations of chart audits include the inaccuracy of paper health records, privacy and security of health records, and missing chart data. At the level of the care provider, several strategies can be used for needs assessment, including chart audits observation, competency assessment and reflective practice. Most people operate on “automatic pilot” and spend little time reflecting on tasks that they spend most of their working time doing. Most individuals will unconsciously adapt to worsening conditions or tolerate a gradual lowering of standards to a “lowest common denominator” situation effect. Active strategies must be put into place to counter these natural trends – namely acknowledging that routinization of tasks leads to uncritical activity and that within an uncritical, unquestioning working climate, individuals and teams will unconsciously adapt to worsening conditions. 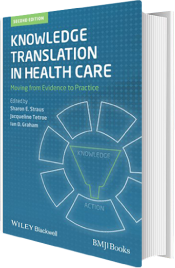 *For more information on knowledge-to-action gaps, please refer to the full publication “Knowledge Translation in Health Care: Moving from Evidence into Practice” (2013).